Here’s the most important thing to remember; the ‘scrambling’ gets done when you whisk the eggs in the bowl – not in the pan! Gentle scraping and swirling of the pan is all you need to create the lightest and fluffiest scrambled eggs; very little fiddling is needed. In fact, the more you move the eggs around the pan attempting to ‘scramble’ them, the more they’ll leak liquid, and become water-logged. Gross. I explain exactly how to do it properly in the recipe below. The delicious rosemary pancetta by Montecatini that I was given a few weeks ago (remember the new Australian Pork TV commercial?) was absolutely delicious paired with fresh organic eggs and a good chilli kick. I made it a little healthier by using no oil, low fat milk and no additional salt (as the pancetta is quite salty), but feel free to use full fat milk or cream to make it more indulgent. Either way, it’s the perfect Saturday morning breakfast to get your weekend on track! 1. Heat a non-stick pan over high heat and throw in the pancetta. The fat will melt and lubricate the pan so no oil is needed. 2. While it’s crisping up, whisk together the eggs, milk, pepper and chilli in a small bowl until well combined. 3. Turn the heat down to medium and pour the egg mixture into the pan. Allow the egg to set around the sides for around 5 seconds, then, using a flat spatula, gently drag the cooked egg to the centre and swirl the pan so the uncooked egg coats the edge again. Continue dragging and swirling until their is no more runny egg. 4. Important! Do not try to ‘scramble’ the egg, that’s already been done when you whisked them with the milk. For truly light and fluffy eggs you need to handle them very little in the pan. If you keep scrambling the mixture it will break up and start to ‘leak’ moisture and become gross and water-logged. 5. Once the egg is almost set, take it off the heat and prepare the toast. By the time you’re done, the eggs will be ready, as they continue cooking with the residual heat of the pan. 6. Serve on top of toast and sprinkle with extra chilli if you like. Looks very tasty! I but with bacon (have) instead of panchetta(don’t). Yum! Great instructions for scrambled eggs Christie. Pancetta always make things taste better too! Delicious! And there’s nothing worse than water logged scrambled eggs. Great minds think alike darling, I did poached eggs lol! It’s not often something actually makes me salivate but that sure did the trick. I have never thought of adding chilli to scrambled eggs before. I am sure it is delicious. Now this looks like something I would be happy to wake up for even very early in the morning:)! I can’t even imagine not scrambling in the pan. You know I got turned off scrambled eggs after eating terrible scrambled eggs in restaurants here in the US; I guess people don’t care, they keep ordering them! @Peter – I couldn’t agree more, esp. free pancetta! @Josephine – Let me know how you go! @Lorraine – Yes! Your egg poaching tip is very clever. @Mallika – Glad I could help, your easy Indian recipes are the best! @Shannon – Wow, thanks! I love chilli and try experimenting with adding it to everything, it’s great on scrambled eggs if you dare to try it. @Cherie – Ha! Yes, a well-cooked breakfast is definitely worth a little less sleep. @Gail – Give it a try, it’s really easy and sooo yummy! @TasteofBeirut – Thank you very much. I know what you mean about American style scrambled eggs – I was not a fan when I visited last year. Your method for scrambled eggs is simply a broken up omelette. 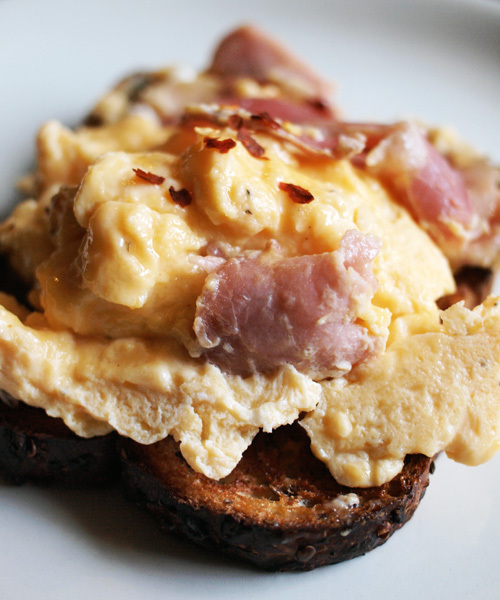 The best scrambled eggs need to be stirred continuously at a low heat then you achieve a fabulous creamy texture. If you can’t be patient though your method is much better than trying to rush the traditional method. I love eggs with pancetta! that picture is totally mouth watering!